They are not a lot, but we heard they can multiply as much as 3 times a day or so, we'll see.And I'm just excited to begin feeding them the compost I've been preparing for a long time! Why it took so long, it seems that despite the vast quantity of the red wrigglers at the local agriculture department in town and in the nearby red wriggler farms, there were no red wriggler worms for sale. Up to this time I also wonder why. But oh my, I'm just ecstatic to have our first batch! So here they are quietly in this improvised vermiculture bin made out of a used biscuit pail - courtesy of my hubby. Hubby also placed a fine mesh cloth at the bottom and on the cover so they wouldn't escape. We are being extra careful with them because these red wrigglers supposedly cost 500-800 pesos a kilo, depending where the red wriggler farm is located. Woo-hoo! We are blessed! Just this morning, brought about by some drive in me, I was anxious to get to the bottom of this so-called "irregular government practices" that we thought of giving it a go again and visit the local agriculture departments. 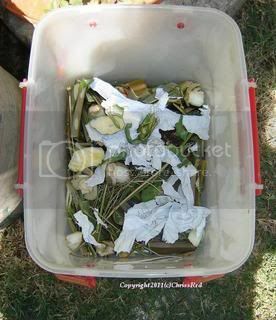 I can't really say for certain about the issue as we only got second-hand information that agriculture LGUs have no red wrigglers or worms for composting. So there, without further plans and just a spur-of-the-moment visit, hubby and I went back to all those LGUs and requested for what we need, even planning to negotiate on purchasing just half a kilo of the red wrigglers if we get disapproved. First stop was the neighboring town's agriculture office. Sad, they closed by 2:00 PM because they simply had to leave early. "Your taxes are working for you" rang in my head. So we went to our own local agriculture department next. It was quite a surprise really, the department head and all employees were in today on a Friday! Apparently it's their salary day, and good for us, they were so generous! The head of agriculture was kind to write us a note of approval so we can pick-up our "first" batch of red wrigglers (African Night crawlers). He approved our request for 30 pieces. And when we got to the Municipal Nursery we were given much more, around 50! Now that is surprising! 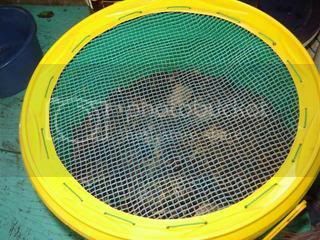 I am just as excited to try my hand in this vermiculture business by beginning small. I'm still considering it as an experiment if we can make them grow and multiply sooner. 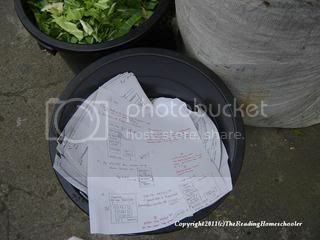 Once again, I will keep you greenie folks posted with my worm composting how to articles. 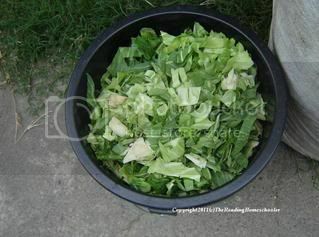 1.Green materials such as fruit and vegetable peels (limiting citrus peels), fresh grass, cow manure. These green materials are usually green or colorful and wet. They provide the nitrogen of the compost to grow and reproduce more organisms to oxidize the carbon. 2. 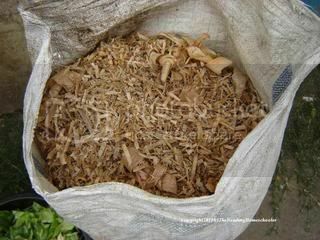 Brown materials such as wood shavings, sawdust or dried banana leaves. These provide the carbon content of the compost. 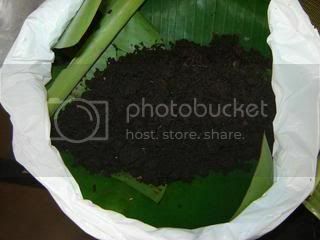 The ratio suggested for the compost is one part nitrogen and 30 parts carbon (1:30) to keep the balance. Weighing the materials is necessary to get the right mix. Important: After mixing them thoroughly, don't forget to pour right amount of water on the mix to speed up decomposition. Add some decomposed mixture if you have some . 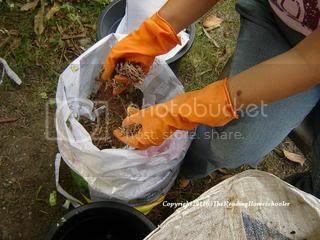 After mixing, tie the sack tight enough, place a plastic mat or tarp underneath to keep them ants away. Wait for 2 weeks to decompose. 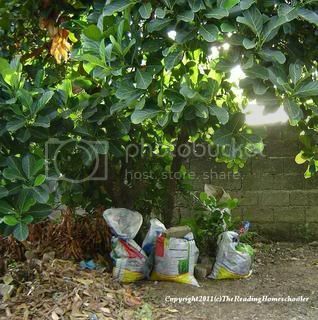 Eventually it's best to keep the sacks under the shade away from heat and sunlight. 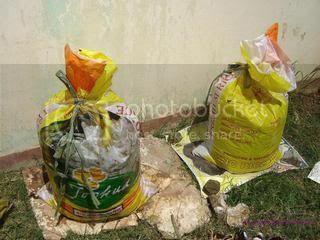 Occasionally, within the two-week span, open the sacks from time to time for proper aeration.